Green beans, a Thanksgiving staple, but at our house, the green beans always ends up on everyone’s plate as an obligation because it’s a Thanksgiving tradition, not because people are actually that excited about Green beans. So this year, we decided to change that, by pulling together these recipes for green beans that actually taste good. NOT the obligatory yuck that ends up at many Thanksgiving gatherings. We start with homestyle peppercorn green beans. A simple recipe with lots of bacon, pepper and flavor! Easy green bean casserole with blue cheese is an amazing twist on the traditional green bean casserole. Pull out the crock pot, because this next recipe involves sausage, green beans and some tasty potatoes all in a slow cooker! If you’re out of oven space, you can still cook the traditional green bean casserole in your slow cooker. This recipe needs no introduction, just listen to it’s name: green bean almondine with garlic and blue cheese. It could take the most passionate of green bean haters and make them appreciate the vegetable! Balsmic green beans add an unexpected kick to an otherwise average vegetable. There’s nothing like the simple flavor of roasted green beans. Easy to make and delicious! 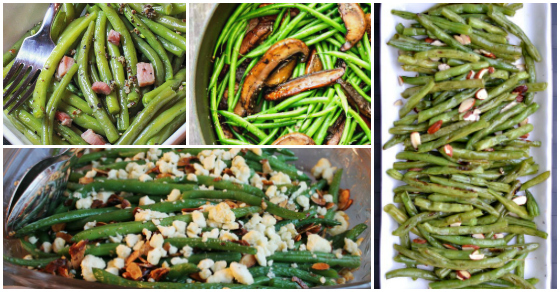 Add a little bit of sweet to the table, with brown sugar green beans! There are few things that you can’t wrap with bacon without making it amazing, and this recipes for bacon wrapped green beans is not exception! Traditional green bean recipe down to the onions on top, except this time with BACON! Onions are a favorite, which is why I’m excited about this green beans with caramelized onions recipe. 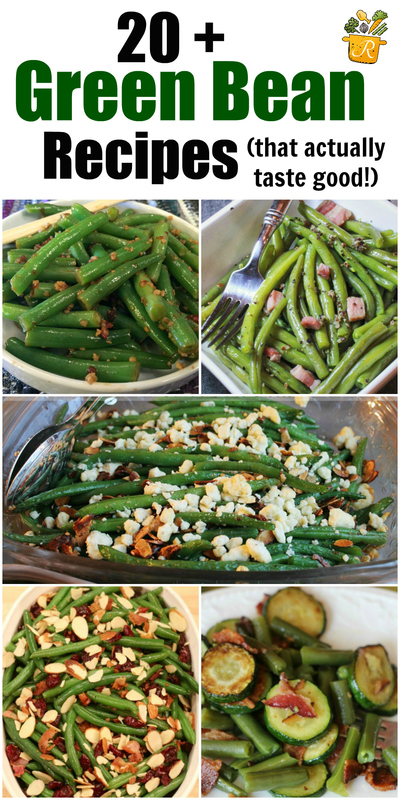 Bacon cranberry almond green beans add a few of the traditional Thanksgiving recipes together and it is wonderful. This one would make a great gift OR would be easy to bring to Thanksgiving across the country – homemade canned green beans. I can’t handle the spice, but I know lots of other people in my family would love this copycat recipe for spicy green beans. Garlic green beans and portobellos with parmesan just four ingredients but it’s healthy and delicious. They say this recipe for green bean cucumber salad is only 3 weight watcher points if you’re keeping track! Roasted green beans with balsmic browned butter is basically the best recipe name I’ve ever heard, and the photos definitely keep up! Let’s try this one asap! Let your taste buds head across the pond with this yummy recipe for Dutch green beans. Green beans with zucchini and bacon, it gets all browned and delicious and makes you actually want to eat green beans! 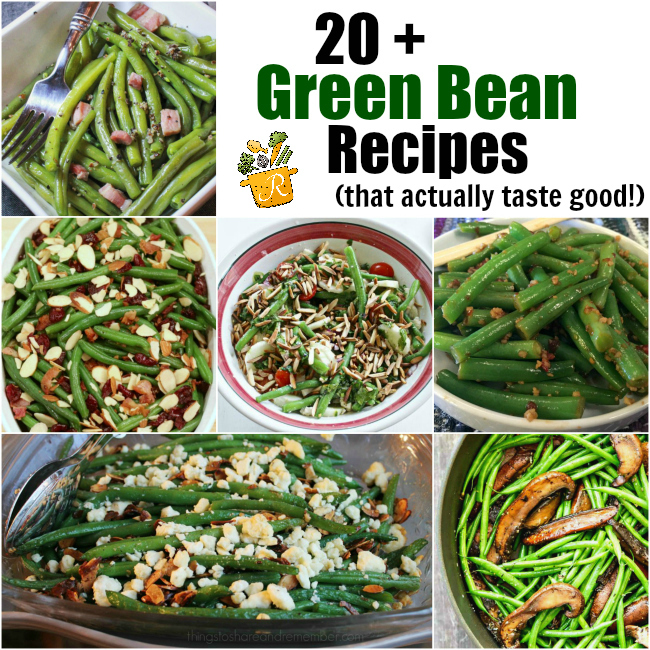 We live in Texas, so would would this list be without a recipe for Southern green beans! Last but not least, they say this is the BEST green bean recipe, so it seemed fitting to close with it. Do you see how many times bacon was listed in these recipes? Sorta makes you wonder if green beans are just an elaborate secret plot to get bacon on Thanksgiving day.